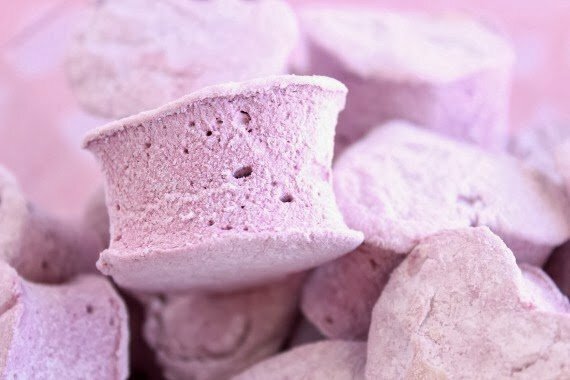 For a long time now, it’s always impressed me whenever I see somebody who’s taken the time to make their own marshmallows. Homemade marshmallows have been on my list of things I’ve wanted to make in my own kitchen for a long time. Well, I finally made some, and you know what? They’re really easy to make, and they taste far better than ones you buy in the grocery store. I found this recipe on the Food Network website and they listed this as an intermediate level of difficulty. I’m here to tell you, on a scale of 1 – 10, 1 being really easy and 10 being really difficult, this rates about a 3. As long as you have a stand mixer for whipping and a candy thermometer for making sure your sugar is at exactly the right temperature, it’s a no brainer. 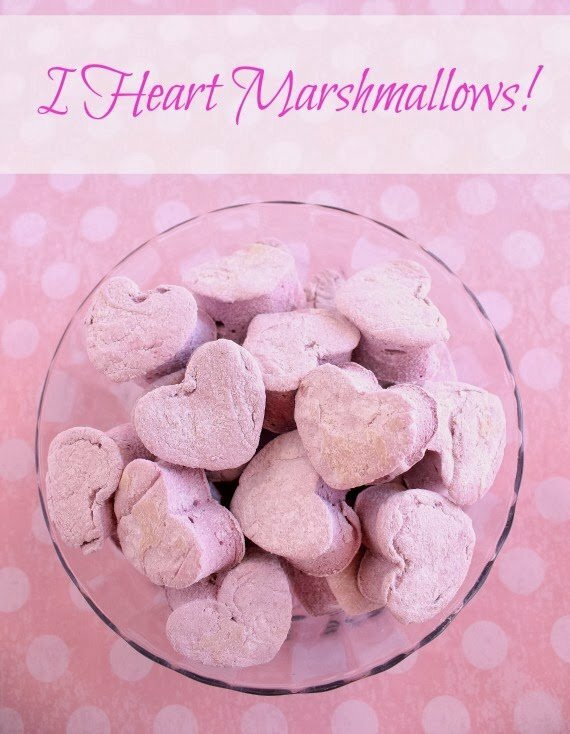 *Note – If you’re using a specialty cutter (like I did with the hearts) you’ll not get the same yield as you would if you cut your marshmallows into traditional square shapes. For the largest yield of presentable marshmallows, I suggest cutting them into squares (which is how the recipe is written). -In the bowl of a stand mixer, add the gelatin to 1/2 cup of ice water. Stir and set aside. -In a medium saucepan over medium heat, combine the remaining 1/2 cup water, granulated sugar, corn syrup and salt. Cook, stirring occasionally until the sugar is melted. -Increase the heat just slightly and allow the mixture to come to a boil, stirring occasionally. After about 7-8 minutes, use a candy thermometer to check the temperature. Once it reaches 240 degrees, immediately turn off the heat. –Carefully pour the hot sugar mixture into a easily pourable glass measuring cup. -Place the bowl of the softened gelatin onto the stand mixer base and attach the whisk. Turn the mixer on low speed and while it’s running, slowly pour the hot sugar syrup down the side of the bowl and into the gelatin mixture. Once you have added all of the hot syrup, increase the speed of the mixer to high. Continue to whip the mixture on high speed until it becomes very thick and has increased in volume (approximately 12-15 minutes). -Add in the vanilla extract and food coloring (optional) and continue to whip for an additional 1-2 minutes. -While the mixture is whipping, prepare a 9×13 baking pan by spraying it with baking spray. -In a medium bowl, stir together the powdered sugar and cornstarch. Add about 1/4 cup of this mixture into the prepared pan and move it around to completely coat the bottom and sides of the pan. -Scrape the marshmallow mixture into the prepared pan, and use a spatula that has been sprayed with baking spray to evenly spread the mixture into the pan. -Sprinkle the top with additional powdered sugar/corn starch mixture and set aside the remaining sugar mixture for later. -Allow the marshmallows to set for at least 4 hours. -Turn the marshmallows out onto a cutting board and cut them into the desired size and shape (using a cookie cutter or pizza wheel) you’re looking to make. -Toss the cut marshmallows into a bowl with the remaining powdered sugar/corn starch mixture and toss to coat. -These marshmallows will keep for up to a week in a sealed, airtight container. Well then, I think it’s about time that I go make a few steamy mugs of Vermont Hot Chocolate so I can float a few of these babies in it. 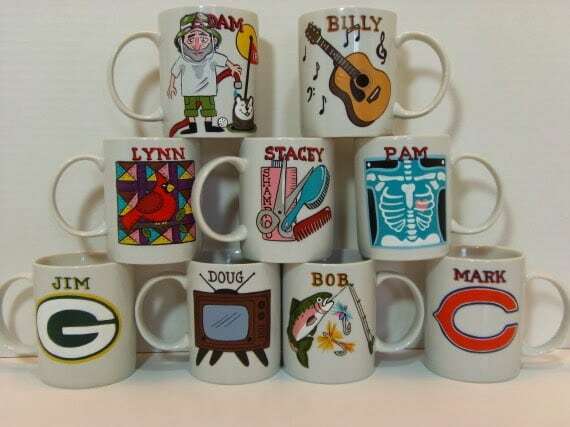 Speaking of mugs, check out these family “mug shots” I painted a while back. This is my family… in mug form! If there is ever anything I can paint for you, please don’t hesitate to contact me or visit my shop which is located in the navigation bar. Custom orders are always welcome and I can work from any photo or description you send my way. Haven't made marshmallows since college Food 101. The mugs are very creative. 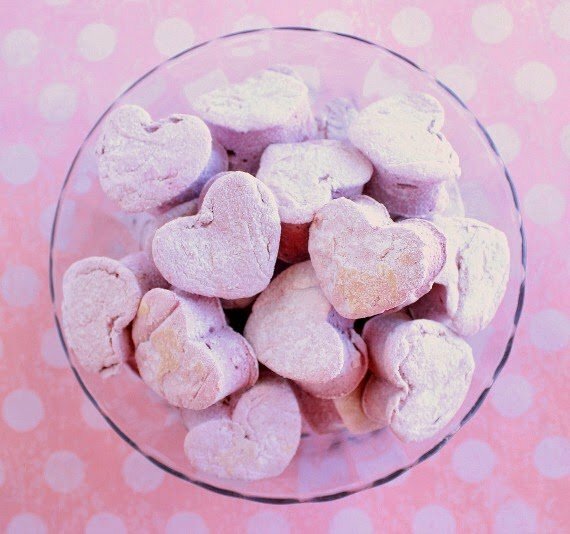 Homemade marshmallows are the bomb! Much easier than one would imagine. Made some with mint flavoring for Christmas, great with hot cocoa. Your heart-shaped ones are cute and would also look great floating in a mug of dark chocolate cocoa. Or what about lemon flavored in a cup of tea? Something I have yet to try and make. Though the pink shade didn't quite come out the way your liked, I think these look great.